Let me say first, welcome to 2014 and second, welcome to the Eve “financial report” of December 2013. Since this is my first post of this type it has more than – these are the results and bye, bye( i.e. you may find some tips here). However, in it, I will try not boring you to death by throwing at you numbers after numbers. I think pictures often do a better job than words, in this case I got graphs for you, and bellow I try to make a case to support this claim. The Eve third-party tool jEveAssets has a handy option called tracker which I used to get the graph you see in the first image bellow. It represents the trend of the combined wealth of all my Eve characters over time. As you can see, December was a great first month of implementing my new game plan. My in-game wealth increased from merely 3 Billion ISK to more than 22 Billion ISK. To the readers that don’t play Eve, it means that I could play Eve Online on one account for more than three years without having to pay real money to do it. 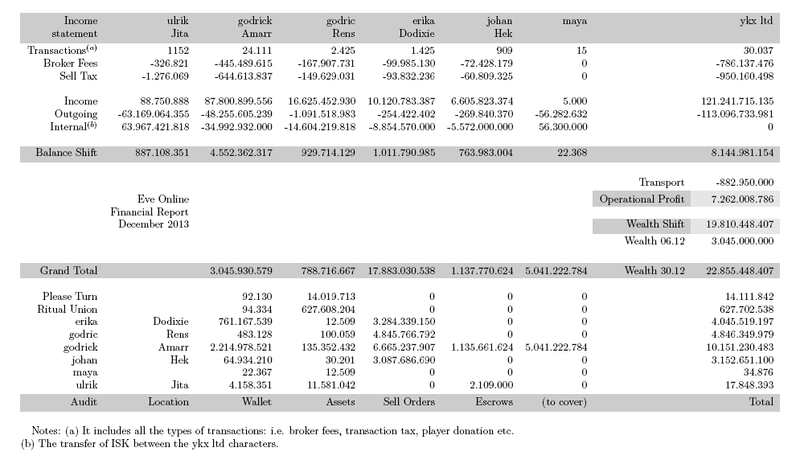 In a word made up from numbers I can’t really avoid them so the next image is a print screen of my Eve Online “financial report” generated in with data gathered from EveMentat and jEveAssets. There are only two parameters worth talking about here. The first is what I call the operational profit, given by the difference between the income and the outgoing summed over all the trader characters, computed over the entire month (in this case from 6.12 to 31.12). The second is what I call the wealth shift, given by the difference between the final wealth (30.12) and the initial wealth (6.12). By definition (better said the definition I use), wealth is to be understood as the ISK someone would get if by some miracle he could liquidate all his assets “now” (where “now” means the date of the audit) at the “today” sell prices, on all the characters he possesses. You can see that, as expected, there is a big difference between these parameters which is precisely the reason of including both in the report. My opinion is that, usually, when you see people with low capital making outrageous claims about their income per hour from trading, it happens because either they under evaluate the time they used in their trading activity, either they use the wealth shift instead of the operational profit to compute it. Most likely scenario – they are guilty on both charges. 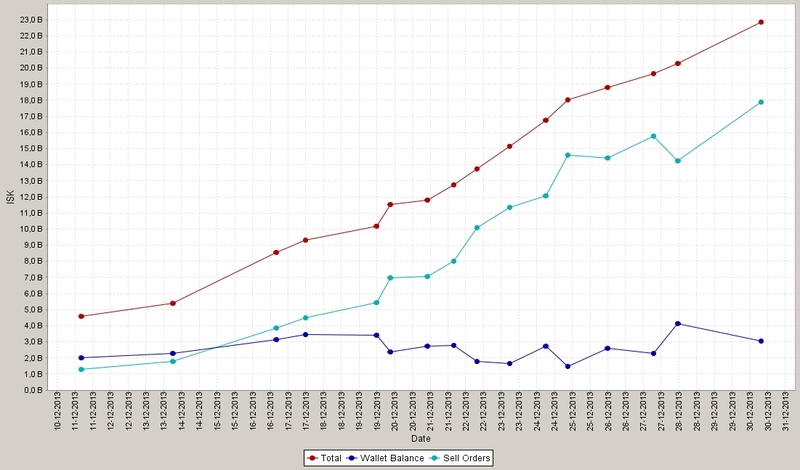 I estimate that my income is around 175 Million ISK/hour to which corresponds a wealth increase of 475 Million ISK/hour. How did I get these numbers? I divided the operational profit to get the income per hour, the wealth shift to get the wealth increase per hour, by the time I waste playing Eve. This includes all of my present Eve activities: market research, buying goods from Jita, hauling them via contractors, setting up and updating market orders, spamming local etc. I take into account there all of my Eve related activities, all except one. I don’t feel that writing text walls like this one is a waste of my time because I see this blog as an attempt from my part to improve my English. Next, the slide show above I would say is self-explanatory. I have nothing to say about it for now. 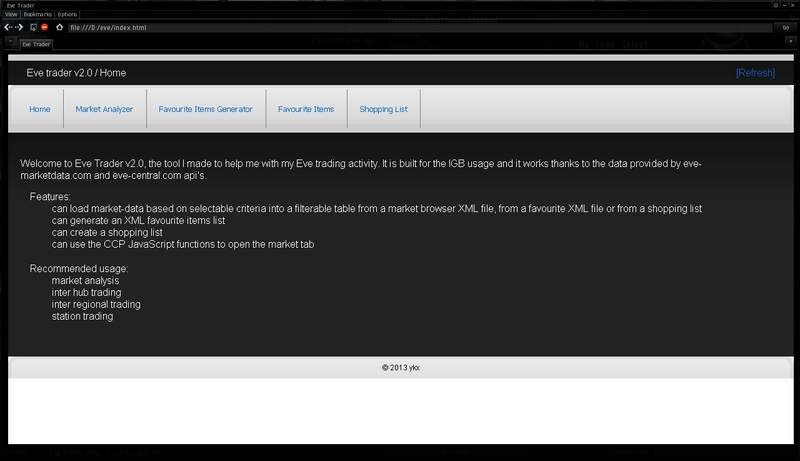 2.1 A Short FAQ on my trading activity. I made my favorite items list using the tool I briefly presented here. The criteria used to get an item on the list are – a Jita minimum sell price of 10 Million ISK and a Jita minimum daily average volume (the number of items traded for that specific item, to which from now on I will refer here as simply the volume) of 3. For now, I’m trading items in the price range of 10 to 100 Million ISK that have a potential profit per item of at least 2 Million ISK. I have another trader character ready to deploy but I still have to search for him/her/it a proper location. You can look at my characters trading skills here if you want. What items do you put on the shopping list? High profit, usually low volume items – I don’t care about the margins here: low or high margin, the profit is still profit. Low price, the margins vary a lot here (10 to 200) but I can buy more types of these and by doing so I increase the sell order time exposure. Note to the reader. They are all low volume items but I further divide them into high (above 15), medium (5 to 15) and low (below 5) categories. The same applies to the price. Do you get involved in the “0.01 ISK war”? No. However, I don’t usually cut aggressively either. “Aha, so you do play the 0.01 ISK game! I caught you!” No, you didn’t. I have a good understanding of the role played by statistics in the “universe” and I try to take advantage of that. I will modify your initial question to sound like “It is possible to make a living from trading alone?” The short answer is “yes”, and now the long answer. The average income per hour of a mission runner is constant in time during the day. This is in contrast with the income of a trader. For example, run some missions for n hours during some day. At the end, assuming X to be your income per hour, you’ll get n*X. For a trader this doesn’t hold. You’ll always get (n-S(n))*X, where S(n) is some positive monotonically increasing function of n such that S(x)=0 for all x in [0,1]. What does this mean? It means that the people staying for hours, continuously, updating market orders are morons. Why is that? Because there is a point, given enough time, after which they could be making more ISK by doing something else. With low capital, you shouldn’t pass over two hours per day, time that you should distribute in many smaller intervals. With high capital, 30 minutes to one hour is more than enough. All I said above at comma 1 it applies to the income per week. It’s very inefficient, potentially disastrous – i.e. you could lose ISK, to trade today then make a break for three days, come back and so on. Don’t get me wrong, you can make some ISK but don’t expect to get rich beyond your wildest dream by trading like that. How many orders should you play? Well, think about probabilities and ask yourself what role location has in all this. Anyway, if you’ll get, somewhere in the future, to play thousands of orders actively every day then it means that you didn’t get the point. I left the transaction part out of the discussion so far. 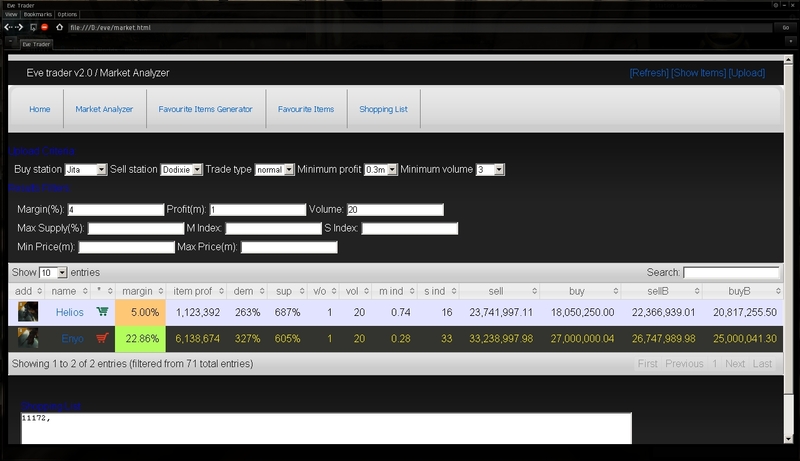 You should learn all the tricks to set up the buy/sell orders and modify them in the least time possible. You’re not there to admire the market tab and the wallet tab. You’re there to get the job done and get the hell out as quick as possible. One simple thing that I noticed so many not doing it is to clear the cache all the times you log out. You’ll find other things to speed up your process. I’m sure. Just look for them. Well, this have to do it for today, it is probably more than enough material for a post anyway. Next post will introduce what I decided to call: “Connections – The ISK Review” which is my, most probably over ambitious, project on developing an extensive review( and guide) on the Eve Economic System and time efficient strategies on trading. It will take some time to make it (estimated time for completion – 2 years), so piece by piece will have to do it. Thanks for reading and have fun. By Ritual Union in Trading on January 2, 2014 .
a very good post – i like your trading strategies / style and measurement of wealth. I will look forward to reading more of your posts. one additional comment though – if i read this correctly your Operational Profit could have been decreased by say 5bn if you have bought 5bn of items on the last day of December from Jita. Of course your wealth shift would perhaps have risen by 7bn when you posted them to sell. In an ideal world we would have a way of valuing all sell orders at the price we purchased the items for and so we would only recognise a wealth shift when a sell order was converted into ISK. I don’t think you need an ideal word for it – the real world is a good candidate. I know you meant it as a figure of speech, better said I think you meant it that way (speaking about the ideal world). The thing is that I don’t try to copy what people are doing in the real world because there, if you have a business, you have, for sure, someone to do it for you and that someone is paid to do it. In Eve, in my Eve at least, I don’t have people working for me. Anyway, you’re reasoning is correct. Now I could argue that it is not a problem at all. If you have reports for consecutive months, the errors will compensate on average (i.e. that kind of differences will just transfer from one month to another). However, my proposal is to leave it like that. You’re correct, after all. Instead of arguing in vain on a cause that I already lost, I want to emphasize one thing about my approach on trading in Eve – I try to do everything as simple as possible without losing essential pieces of the “big picture”. I don’t concentrate on individual items and I can do that because I’m not manufacturing anything for now. My entire focus is on the global activity. However, I need to measure globally both certain things and uncertain things about my trading adventure. The operational profit measures certainty. I know what I bought and what I sold. The wealth shift measures uncertainty. To put it in another words, it is a measure of expectation since most of my wealth consists of sell orders. I don’t know for sure when and at what price the items will sell. I need both parameters because otherwise I would be deluding myself. The system I use provides, in my opinion, both simplicity and completeness which is what I want to have.